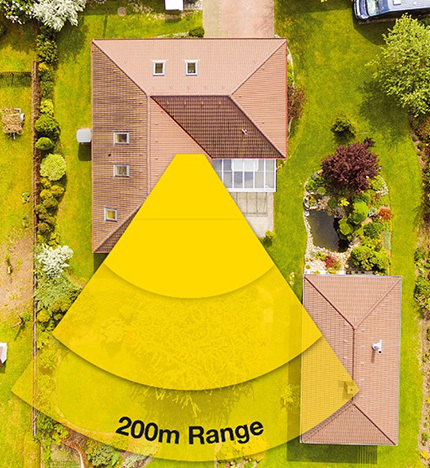 Ideal for securing a large home, this kit offers a 200m wireless range and telephone call alerts. Includes pet friendly PIR motion detectors. The Yale Intruder Alarm Kit Plus - IA-230 is a fully featured alarm system designed to secure any type of home. The system is armed or disarmed using a PIN code on the keypad control panel and can also be disarmed with a simple tap on the control panel by one of the RFID tags or by a button press on the remote keyfob. When the alarm is triggered a loud external siren will sound to alert others of an intruder. Providing the keypad is connected to a landline telephone socket, the system will also alert you via telephone when the alarm is triggered and can be activated and deactivated via a touch tone phone. The pet friendly sensors activate when larger movement is detected, making it ideal for homes with one small pet (less than 20 - 25kg). The detectors should be placed in the corner of rooms that are vulnerable to intruders. When the alarm is armed an infrared sensor will detect any larger movement and activate the loud alarm siren.